Hiya friends! Today, it is my privilege to be joining Altenew for their March 2109 Watercolor Brush Marker Release Blog Hop. Follow along for inspiring projects by many talented artists and comment for your chance to win one of several generous gift certificates to the Altenew shop! Creating today’s project was easy peasy with just this, Tropical Fiesta, set of brush tip watercolors. It includes all the colors I needed to get me dreaming about island life, and then some. Come on summer, where are you?!? I’ve created the background on Smooth Bristol paper with the Tropical Fiesta Watercolor Markers in Turquoise. I brushed in ample color toward the bottom and less as I went up the panel. After blending the color out with water, I added several spatters of clear water by sprinkling it from my hand. The clear water droplets disperses the watercolor toward the edge of the clear water and that is where the fun shapes occur upon drying. Set the panel aside to dry naturally for best results. 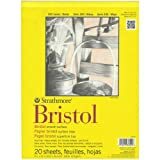 I watercolored Bristol paper panels in the shades of red, pink and orange, as well as green, and allowed them to air dry. Once the panels were dry I ran them through my Minc machine to “iron” them flat. I then die cut the Hibiscus Garden 3D flowers (<—LOVE these!) from the watercolored panels and layered them together with liquid glue. I tucked the assembled flowers into the Gradient Lines die cut in white I had adhered to the turquoise background panel. I cut an additional strip of white just wide enough for the sentiment stamped in Jet Black and adhered it just under a petal. Giveaway: Altenew is giving away a $40 gift certificate to six lucky winners! Please leave a comment on the Altenew Card Blog and/or Altenew Scrapbook Blog by Thursday, March 28th for a chance to win. We’ll also draw a winner to receive a $20 gift certificate from the comments left on each designer’s blog on the blog hop list below. All winners will be announced on the Altenew blogs on 3/31/2019. Beautiful card, Janette! I love the rich color. Your cards make me smile. So pretty. The flowers are so vibrant! I love how the colors blend together! Gorgeous crisp clean card! Thanks for sharing! Happy Spring to everyone!!! What a dtunning card from an amazing designer. So much learning from this hop and the itch to get started creating. You are quite an Artist as I had to look again and again as I swear you popped up those centers Haha! Thank you for sharing your talents and inspiration. So pretty card. Love the die cut flower on the top of the blue background.. Pretty card. Rich, bright and beautiful. The gradient background die works perfect with your card. So very pretty, lovely colors! So colorful and vibrant, your card is beautiful! Thank you for sharing another great technique! I love the watercolored hibiscus diecuts – really makes this card shine! Beautiful colors. Looks like they are easy to use. Beautiful card and I love all the layers you used. What a pretty card! I love all of the tropical flowers! The brightly colored flowers look great against the turquoise background! Absolutely gorgeous colors! Fabulous card Janette! Love the vibrant colors! Thanks for all you share! Gorgeous!! Love these new colors. What a rich and beautiful card! Rocking this new watercolor set! Thanks for sharing! Your card is fatantastic! Love those beautiful colors you used! Beautiful markers demand beautiful work and that’s what you did! Thanks for the inspiration. I’d not heard of “ironing” paper with the Minc. gorgeous. Love the new color collection. These colors are so gorgeous. As is this card. Love the background and tell striped panel is perfect to tuck those lovelies into. Love it. Beautiful job , I must have this turquoise! What a STUNNING card. The colors are so rich and vibrant. That Hibiscus set is amazing and you’ve done a wonderful job! I love your card! The flowers are stunning! This is such a stunning card. Love the vibrant colors of these markers. So pretty! Great depth of color. Gorgeous card! The colors are perfect for the Hibiscus. Such a beautiful card with a perfect tropical feel to it. I love these tropical flowers against the blue! JUST GORGEOUS! This card is stunning. I too, love the Hibiscus 3D flowers, and the layout is perfect with the gradient die. Summer, here I come!! Love the cards and backgrounds! This is a great new marker set! Gorgeous card! I love these beautiful colors! 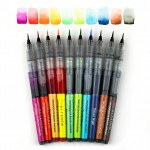 Awesome set of watercolor brush markers! Beautiful tropical flowers and I like the background. This may be one of my favorites so far! Love the water color background. Such a vibrant contrast to the flowers! So pretty!! It definitely has me dreaming of the Island life! The way you used the turquoise watercolor pen on the background really is similar to the DO and am intrigued! You’ve taught me so much in your one card using these watercolor markers! Love how you “ironed” out the paper before die cutting the flowers and leaves!! Such a beautiful design with the gradient lines cover die and Ombre coloring! Fabulous card! Gorgeous new colors of Watercolor Brush Markers. Love the dreamy blue background. Wow! Gorgeous card!!! The colors are beautiful!!! I love this! I’ll pretend it was my birthday card. Beautiful and perfect!! Colors are just great on your card. This new marker set is so vibrant. I love it. Thank you so much for sharing today. Love this gorgeous card. It is so vibrant! I also love the beautiful background. Beautiful! I love hibiscus! The colors and textures are stunning! I love your hibiscus flowers!! The colors are bright and vibrant. The background is so pretty. I love that blue. I have to have these brushes!! Gorgeous hibiscus! I just love the look from coloring the paper then cutting it. Beautiful colors! simply beautiful – love your background – makes the flowers pop! Love the card and the way you made the backgrounds. Thanks for sharing. Great flowers! I am amazed at the shades of reds and pinks! Just beautiful! Thanks for the inspirtion! What a beautiful card. I love the way you tucked the hibiscus in the lines of the cover plate, just perfect! Oh my Janet what a wonderful card. I’m in love with the Tropical Watercolour Markers and that Gradient Line die cut. Your Hibiscus flower looks like it’s straight from the garden. Thanks so much for sharing these new products and for inspiring as always. Love the tropical vibe of your card! Definitely another tropical card! Makes me long for a Caribbean cruise again! I also like the beautiful ocean background. Great card! Your card is just simply beautiful. Absolutely love love the coloring. Beautiful job as always! Thanks for sharing your creativity! I love the striped openings over the blue background. Thanks for some great inspiration. Fantastic card! I really like that background die. I’m pretty sure I have it on my wish list (which just keeps getting longer). I love the coloring behind it. I’m a sucker for background washes. Love your vibrant floral card! Janette, your card is so lovely!! I’ve never purchased a die without a stamp set as I hadn’t thought through what could actually be done with it, but you & a couple of other crafters have opened my eyes. Thanks! I really like the turquoise loose watercoloured background uner that great background die. It’s great these watercolour brushes can give such vibrant colours to a project. Great colors for these Hibiscus dies! All the Altenew 3D dies have such pretty details & this new set is a great addition. Love the vibrant flowers against the gradient lines background. The blue and white look so pretty with reds and greens of the hibiscus blooms. Beautiful card! Love the new colors! Your card is stunning! I love the colors you chose! Beautiful! Thank you for the inspiration! Gorgeous card. The colors are very vibrant and immediately catch your eye. Your background is stunning and such a good use of cover die. Thanks for sharing your time and talent with us. Beautiful card! I love that you used the markers to watercolor paper and then die cut them with the flowers. I don’t have a lot of color cardstock and this lets you have any color you want. The colors in this set are awesome! Love the background and design of your card – wonderful! Your colors are gorgeous! It seems as though they are glowing. Well done. Beautiful card, amazing colors. I love this new Tropical Fiesta watercolor marker set. Love the beautiful background, Janette, & the tropical flowers! Great tip on running the wc paper thru the die machine to flatten. Will be trying that. Love your awesome card! Wow! I just love the colors…how appropriately tropical! Gorgeous card! Beautiful – love the deep, bold colours of your flowers and the gorgeous, varied/splotchy background – so lovely!!! Love the turquoise watercolor under the cover plate, and the coloring s you used to create the Hibiscus die cut flower. Bold and deep—my kind of colors! Thanks for some great ideas here today! Wow that card came out gorgeous. I love the background!! I love the depth of the reds in particular that you got for these tropical flowers. It’s just a gorgeous card – those lovely blues in the background too…..such a great design! Definitely need to add some Altenew Watercolor makers to my cardmaking stash! Your flowers are so vibrant and the contrast with the background blue is perfect. This card is beautiful! Love the the look of your background! It reminds me of a calm river. Gorgeous card! Such a fabulous design! Love how you tucked the flower into the background layer. Very pretty. Thanks for sharing. Wow!!! Such a stunning card, Great job! Thanks for sharing your awesome talents!!!! So fresh, bright and happy, Janette! You card is gorgeous with a wonderful mix of die cuts and watercolouring! These bright new colours are so pretty and add so much to your clever design! Thanks so much for sharing and the great inspiration! This card really does feel like a day in a tropical paradise. I love the reds you managed for your hibiscus! Thanks for sharing with us. Love the papers you created for those floral dies, gorgeous depth and richness! Wow, what a fabulous and creative design. Stunning card and such beautiful watercoloring. wow! this card MUST make the recipient happy! great design!